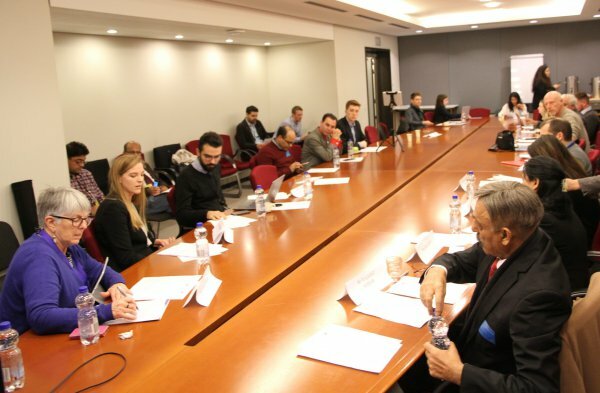 On Wednesday, 21 November 2018, the Unrepresented Nations and Peoples Organization (UNPO) in cooperation with MEP Julie Ward (S&D) organised a round-table titled “Human Rights & Democracy in Pakistan: Reflections on the 2018 General Elections”, at the European Parliament in Brussels. Counting with the participation of representatives of political parties in Pakistan, human rights advocates and Members of the European Parliament, the round-table has outlined important issues observed in the 2018 National elections and prompted a constructive dialogue on the democratic challenges and human rights situation faced by minority communities in the country. Ms Madeline Vander Velde, Project Assistant at the UNPO and moderator of the event, introduced the context of the Pakistani elections and the several human rights and democratic challenges that surrounded it. After the opening remarks, MEP Julie Ward started her speech by observing that the event took place at strategic moment, after the publication of the report of the Election Observation Mission, which can be used as source to discuss the last Pakistani election through the different lenses and approaches that were combined in its production. Ms Ward further shared what she has experienced and observed during her visit to the country, pointing out the importance of recognizing the improvements that were achieved in the election, although emphasizing there is still much left to be done. She mentioned some of the problems observed by the EU mission, such as issues in the campaign finance regulation, lack of engagement of the civil society, oppression and insecurity of the media, the presence of the military in the polling stations, restrains on the participation of women and, in particular, of disabled people. In this matter, Ms Ward drew attention to the fact that these issues contribute to the lack of trust of the civilians on the electoral process, a problem that while not being restricted to Pakistan, undermines the legitimacy of and the democratic system itself in several countries. Ms Fauzia Viqar, Chair of the Punjab Commission on the Status of Women (PCSW), participated remotely in the conference by sharing a video. She highlighted the struggle of women and the work that the PCSW has done in the past. In particular, she outlined the situation of voting engagement and women with disabilities, and how they continue to be left out of the electoral process due to the lack of suitable infrastructure and awareness. Ms Eiga Kenny, Program Officer at the Centre for Legal Aid Assistance and Settlement (CLAAS), followed by observing the lack of suitable infrastructure in several polling stations. Since, on more than occasion, many polling stations had inadequate space for the voters, who were then unable to cast their votes. Such an issue more specially affects disabled people, further excluding them from the democratic process. In particular, Ms Kenny highlighted the struggle of religious minority groups which, although Pakistan has recognized religious freedom, continue to suffer oppression and to be left out of the democratic process in the country. Furthermore, she referred to Malala Yousafazi and several other women who were harmed for speaking out for their struggle, proving that in spite of changes in legislation, practice had not changed much. Finally, Ms. Kenny discussed the issue surrounding the Blasphemy Law. She has highlighted that victims accused of blasphemy often face serious long-term sentences, which sometimes include death, such as the case of Asia Bibi, who’s charges were dropped three weeks ago. Dr Rubina Greenwood, Chairwoman of World Sindhi Congress (WSC), focused on the struggles surrounding the Sindh people, arguing that in spite of the change of government, their suffering and the continued violation of their rights has remained the same. In particular, Dr Greenwood has highlighted the number of cases of enforced disappearances in the province, over 1200 cases, the forced conversion of hindu girls who are forced into marrying Muslim men, many of which are as young as 8-years-old, and the consequences of the constructions of dams to the Sindh people. The last would further harm the livelihoods of people who, while not profiting from development initiatives, continue to face issues such as extreme poverty, restrictions to their culture and language, diseases, lack of education and environmental adversities. Ms Uzma Noorani, Co-Chairperson at the Human Rights Commission of Pakistan, also participated in the conference through video message, in which she outlined the cases of enforced disappearances, the consequences of the Blasphemy Law and the fact that it seems exclusion has become the new moto in the country. Making reference to the well-known phrase “people shouldn’t be afraid of their government, the government should be afraid of their people”, Ms Noorani highlighted the core of what democracy ought to mean. Mr Mirza Wajahat Hassan, exiled Chairman of the Gilgit-Baltistan Thinkers Forum, followed by shedding light on one of the more controversial and not often discussed issues: the region of Gilgit Baltistan (GB). Having been illegally occupied by Pakistan for 71 years, Mr Hassan argued that the Pakistan adopts a double standard when it comes to simultaneously referring to Gilgit-Baltistan as a province of Pakistan and as a disputed territory in the Kashmir issue. As such, Mr Hassan outlined the dilemma faced by the GB’s population who, although living in an area merged by Pakistan and facing human rights violations, continue to have no rights to vote in Pakistani elections. Finally, Mr. Hassan discussed the project of the China-Pakistan Economic Corridor (CPEC), which cuts 600 kilometers into the Gilgit-Baltistan area. Next, Mr Fernando Burgés, Programme Manager at UNPO, spoke on behalf of the Balochistan Member at UNPO, highlighting that the region has one of the highest number of cases of enforced disappearances and systematic violence (including extra-judicial killings) in the world. Mr Burgés called on international bodies to voice this struggle. Finally, Mr Jean Marie Rogue, European Union Delegate of the International Federation for Human Rights (FIDH), gave an outline of Pakistan’s commitment to human rights as a signatory to the EU’s GSP+ agreement. He noted that the assessment of the conventions should be a platform for the participation and dialogue with the civil society. Furthermore, Mr Rogue stated that in spite of all that is left to be done, it is important to recognize the improvements the country has made. Following a constructive session of questions from the participants to the speakers, MEP Julie Ward closed the round-table by reinforcing the need for the civil society to build trust and strong relationships with elected politicians, so that they can represent the interests of overlooked minorities in Pakistan.